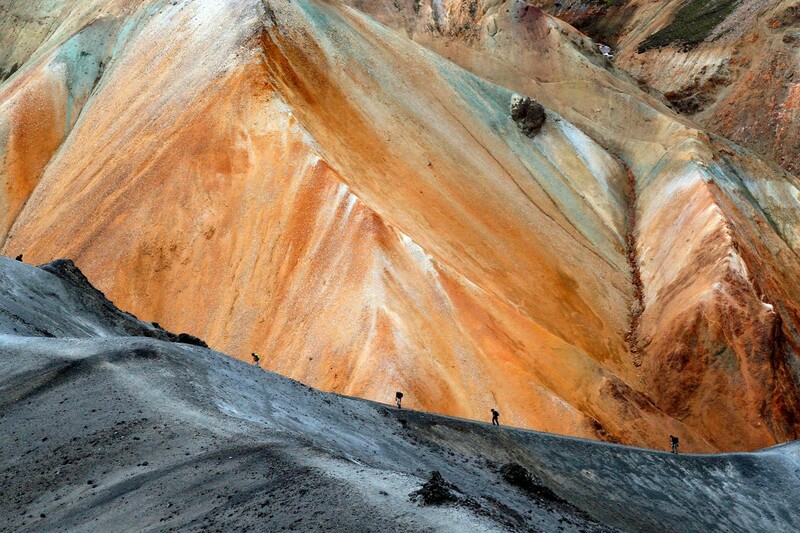 Iceland’s most famous trek from Landmannalaugar to Þórsmörk lives up to the hype. See all our Laugavegur Trail tour options. The rumors are true! Trekking in the southern highlands, from the geothermal hot spots in Landmannalaugar to the lush green landscape in Þórsmörk valley, is even more beautiful in person. Your highly experienced and knowledge trekking guide will take you in between vibrant yellow rhyolite mountains, over black sand deserts and past majestic canyons during this adventure. The magical and diverse landscape, combined with the long and bright Icelandic summer days, will capture your nature loving heart. Your guide will show you all the popular sites and hidden gems along this trail and tell you stories and folklore. In the evenings, you will relax and rejuvenate in cozy mountain huts and enjoy delicious Icelandic meals. We top off this amazing adventure with a celebratory BBQ on the last night in Þórsmörk. It is not a coincidence that this trail was named as one of the 20 best treks in the world by National Geographic. See Laugavegur Trek (Landmannalaugar - Þórsmork) tour video. English/French departures every Monday, English/German departures: June 26, July 12 and July 19. English/Spanish departures: July 26 and August 5.